Oh man, I like this show. I haven’t actually seen too many of these original black-and-white episodes, but I really enjoyed these. I like the writing, the little flashes of wit, and the straightforward style with a minimum of fuss or drama. Once you are used to the deadpan style, I think it makes the subtle moments of action or drama really resonate. 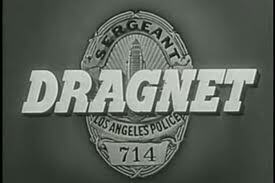 Dragnet’s not to everyone’s taste, but they’re solid, well-produced, cleverly scripted stories. The first one we watched was also the most religious. And yet, except for maybe a split second here or there, it didn’t bother me. Sergeant Friday and his partner Smith investigate the theft of a Baby Jesus statue from a church. This is a sweet episode, clearly playing on the holiday themes. Everything turns out fine in the end, while it has enough of Friday’s dry-as-can-be wit to keep me interested and amused. This is a well known episode, because they got letters about it. Many, many letters. 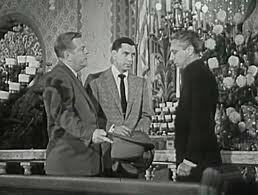 Friday, Smith, and a whole team of other cops investigate the disappearance of two young boys along with one of the boy’s Christmas presents, a gun. This one does not have a happy ending. It occasionally veered into melodrama, but overall I think they did pretty well by the story and the message. I’m not surprised the NRA felt threatened. This one is really a New Years episode. Friday, Smith, and others are manning the phones on New Years Eve when the call comes in that a retired officer has been shot in the street. The rest of the episode just follows the investigation, and the villain is downright scary in his very brief appearance. Overall I enjoyed all of these, but I recommend The Big Little Jesus if you’re feeling sentimental and The Big .22 Rifle for Christmas if you want something sad. Many of these early episodes have dropped into the public domain, so you can easily find them online.